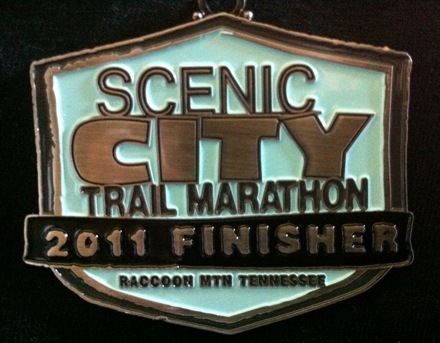 Tag Archive | "Aaron Saft"
Here are a couple of photos of the 2011 Scenic City Trail Marathon finisher’s medal from the race that is put on by local outdoor store Rock Creek. The marathon and half marathon take place on Raccoon Mountain just outside of Chattanooga, Tennessee. 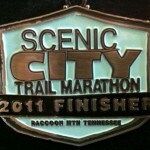 The 2011 Scenic City Trail Marathon was won by Aaron Saft (2:47:44) and Sarah Woerner (3;13:34 course record). 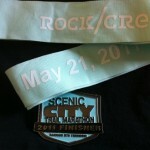 Rock Creek does a great job with their trail series. They put on several well attended trail races throughout the year.